* Fixed Rate APR ran with $250,000 loan amount including 1.250% Mortgage Insurance Premium and standard 3rd party closing costs. ** Tenure or Line of Credit Plan: Assume the youngest borrower was 72 years old when you opened your Plan and you had an outstanding balance of $10,000 at the beginning of the Draw Period with an initial rate of 8.37%. If you took no other advances or payments and the rate increased as rapidly as possible so that the rate was 10.37% in the second year, 12.37% in the third year and 13.37% (5.0% above an assumed initial rate of 8.37%. (The maximum Annual Percentage Rate) in the fourth year and remained at the maximum rate, the minimum payment that would be due at the end of 13 years (based on the life expectancy of the youngest borrower) would be $51,517.55. "Why are interest rates important when choosing the best reverse mortgage?" "Why are your advertised rates much lower than my Bank or Credit Union?" 1.) Many "big banks" charge the maximum allowable fees. Although the fees on reverse mortgages are federally regulated, we will NEVER charge you the maximum just because we can. All Reverse Mortgage often can save you thousands over what these "big banks" charge. 2.) Most "big banks" are restricted to offering only the products offered at their specific bank. However, All Reverse Mortgage company has the flexibility of offering multiple banks interest rates and securing you the lowest available rate in the marketplace. Firstly, I say to homeowners Choose the correct option to meet your needs. You can choose a fixed rate or an adjustable rate and fixed rates sound great, but they are what is called a "closed end instrument" and require the borrower to take the entire loan at the very beginning of the transaction. For borrowers who are paying off an existing mortgage and need all their funds to pay off the current loan, this is no problem. A borrower who is planning on using only a portion of their funds monthly need not pay interest on the entire amount from the very start, eroding the equity unnecessarily fast. An adjustable rate will accrue interest at a much lower rate at today's rates, but has a 10% cap and can go much higher if rates rise in the future. However, the adjustable rate programs do allow you more flexibility in how you can receive your funds. First option would be a cash lump sum. This is not advised on the adjustable product as a cash lump sum request is usually associated with fixed interest rates, however it is available. Second option would be a line of credit. The Reverse Mortgage line of credit is not the same as a "Home equity Lines of Credit or (HELOC) that you can get at your local bank. The Reverse Mortgage line of credit grows in available on the unused portion and cannot be frozen or lowered arbitrarily as the banks can and have done recently on the HELOC's. Third option is a monthly payment option which can be set over a specific period of time and then cease or as a "tenure" which would be a monthly payment guaranteed for life. Fourthly, a homeowner could choose any combination of the three options listed previously. The adjustable rates are currently much more flexible to meet borrowers' needs. One of the things that can determine the amount for which borrowers will ultimately qualify is the rate at which the loan accrues interest. When the margins on the adjustable rates were lower and the fixed rate was higher, the adjustable rates gave borrowers more money in their pockets in the form of eligibility. Now, most borrowers we run through the reverse mortgage calculator receives more money on the fixed rate program. This is extremely important to know if you are trying to get as much as possible to pay off an existing lien. It also means that the higher the margin, the less money the borrower will receive and the faster interest on the loan will accrue. 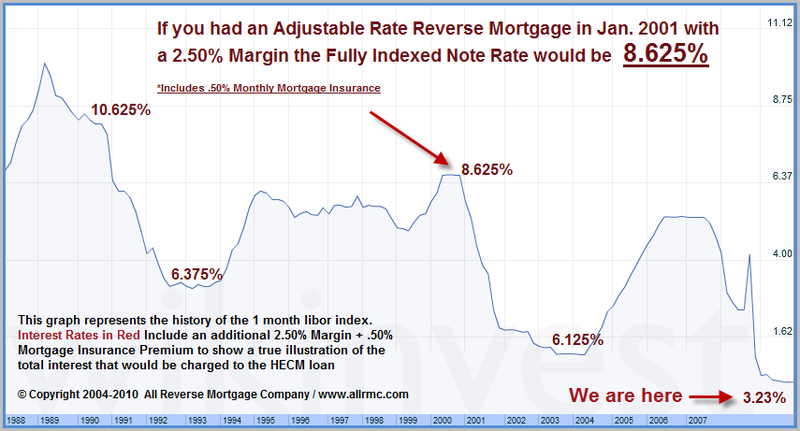 So the thing to look for in a reverse mortgage here is definitely the rate on a fixed rate or the margin on an adjustable rate that is being quoted. LIBOR stands for "London Inter-Bank Offered Rate." It is based on rates that contributor banks in London offer each other for inter-bank deposits. In October of 2007, the U.S. Federal Housing Administration (FHA) ruled in favor of insuring ARM loans based on the one-year LIBOR index. At the same time, HUD also ruled to allow the one-month LIBOR to be used for the purpose of calculating adjustments to interest rates for monthly adjusting Home Equity Conversion Mortgage (HECM). Below is a chart of LIBOR rates for the last 10 years. LIBOR loans normally have lower margin rates than CMT (constant maturity of U.S. treasuries). This is particularly helpful to senior borrowers due to the fact that the CMT margin became increasingly less desirable when selling the loans in the secondary markets and the change helped insure the availability of the market for ongoing lending.